Please use our Contact Form or call to inquire about Annnd… Action! 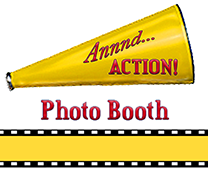 Photo Booth for your next event! We will respond to you quickly, typically within 24 hours. We will reserve a time slot for you upon verbal agreement, and a $50 retainer will be due at time of contract (48 hours) to secure the date/time of your event. Retainers are payable via cash, personal check, money order or Paypal. We will arrive approx. 90 minutes in advance of our scheduled time to set-up and will begin breakdown once the contracted time is over. Don’t worry- if your guests are in the middle of the action, we won’t push anyone out – but like at the supermarket, once time is up, we will have to designate the ‘last’ guest in line and alert others that the photo booth is closing/now closed. If you wish us to remain available for any guests who didn’t get a turn, if schedule allows, we can stay open in ½ increments for an overtime fee of $85 per each half hour accrued. This is strictly subject to availability. On the day of your event upon completion of services rendered, the agreed-to balance will be due. Payment can be accepted via cash, money order, credit card or Paypal. Plans change. Things happen. We understand. Should you have a change, kindly let us know within ten (10) calendar days of your event. We may be able to move things around for you; however, if we are unable to accommodate, your $50 retainer will be refunded. If you fail to notify us within 10 calendar days, your retainer is non-refundable (sorry). Similarly, should we encounter an issue whereas we will be unable to perform services on your time and date, we promise to notify you ten (10) days in advance and your retainer will, of course, be fully refunded. PayPal to accept all forms of payment. Please Contact Us with any questions or to book your Photo Booth experience today.